This absloutely melts in your mouth. I have had so many people ask for this recipe. Strongly suggest using fresh blueberries when possible. Beat egg whites until stiff, add about 1/4 cup of sugar to keep them stiff. Cream shortening, adding salt and vanilla. Add remaining sugar to this gradually. Add unbeaten egg yolks and beat until it is light and creamy. Add the sifted dry ingredients alternately with milk. 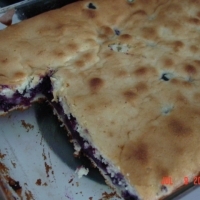 Fold in the blueberries (take a bit of the flour called for and gently shake the berries in it so they wont settle). Pour into a greased 8 x 8 pan. Sprinkle top of the batter with some granulated sugar. I love fresh blueberries about anyway you can think of, but in a cake is probably my favorite way - thanks for the nice post, Ny! Like nytkrew's recipes? Never miss an upload!